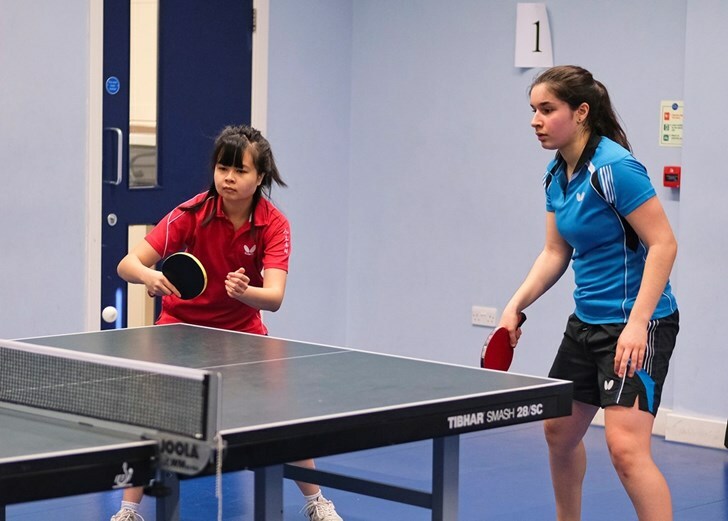 Welcome to Kidlington Forum Table Tennis Club, a premier club with purpose-built facilities, situated 5 miles north of Oxford. All are welcome to come along to one of our open practice sessions. Anne Borrowdale at the ceremoy, with her awards. 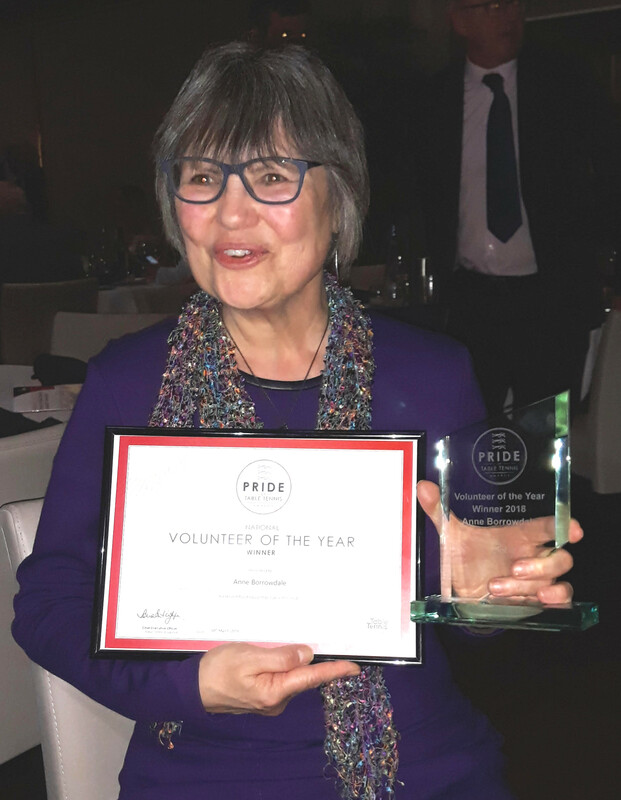 At the Pride of Table Tennis awards ceremony at the end of March, Anne Borrowdale (a member of Kidlington Forum TTC) won the prestigious Volunteer of the Year Award. Anne is the Oxford and District Table Tennis Association’s development officer which she undertakes on a purely voluntary basis. In this capacity she puts in countless hours organising, coaching and developing table tennis. She has worked with the Sport’s governing body, Table Tennis England, on the BeTT project aimed at promoting table tennis in Oxford. She has steered through 12 people to become newly qualified coaches and has grown the sport in the Cowley area. She supports the City Council’s Ping! project which thrived in the past year with the popular Ping Pong Parlour and play for everyone on the outdoor tables situated throughout the City. It has resulted in a number of players turning out for the sessions she operates at Cowley. These include open sessions and coaching for +55 beginners which has particularly benefitted women. She organised a summer league for those of all abilities and ages. It was so popular it is happening again this year. Anne’s work has culminated in the formation of a new club; the Oxford Community Table Tennis Club. It will operate in Cowley and Headington and will cater primarily for social play but will give the opportunity, for those who want it, to play competitively. Anne is a worthy winner of the award. 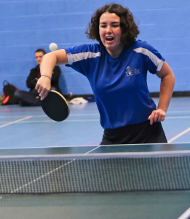 Oxford & District Table Tennis Association website - for the latest league results & statistics, reports and details of upcoming events in Oxford. Table Tennis England is the national association for table tennis in England. Karl Bushell will be running a senior coaching course, starting from Mon 20th May on Monday evenings. Further details can be found on the coaching page; please contact karl@klbconsultants.co.uk to reserve a place. The ODTTA City Championships will be held at Kidlington Forum on Sunday, April 28th, from 10 am to 6 pm. All ODTTA members and members of ODTTA affiliated clubs are eligible to take part. The trophies and medals will be awarded in the evening, along with all the League Presentations, starting at 7pm. For more information, please see the email from John Duncalfe. To enter, please let John Duncalfe know your chosen events as soon as possible at johnduncalfe@yahoo.co.uk. Alternatively just enter and I will put you in for as many events as is feasible, including doubles, for which I will allocate suitable partners. Many Kidlington juniors took part in the City Junior tournament at the end of February. Of particular note were Kiarash Shaddel winning the Under 18 Boys competition, and Vicky Coll and Pelin Karabulut winning the Open Doubles. 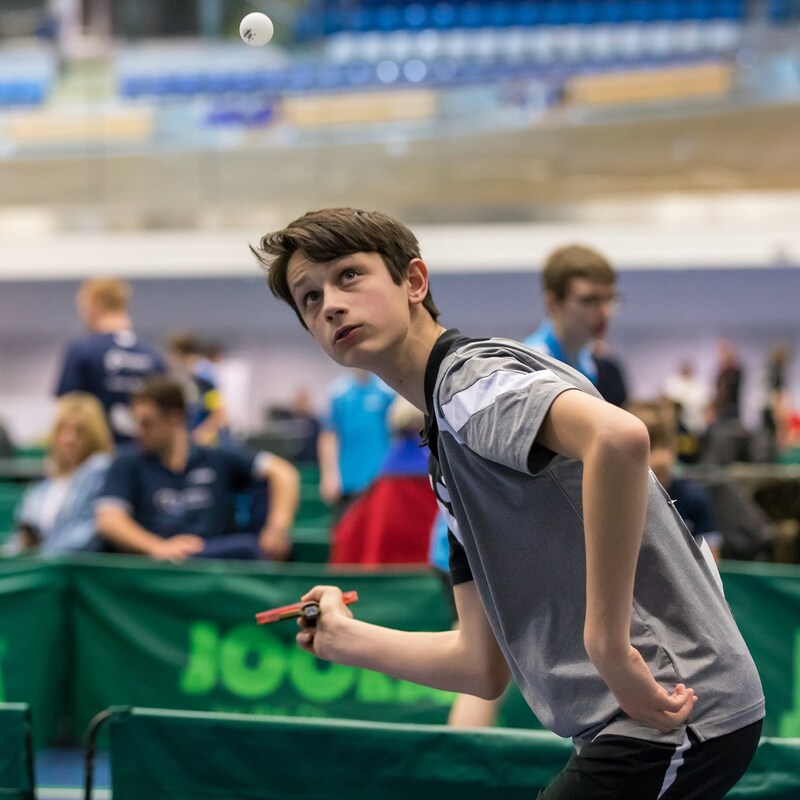 Two Kidlington juniors, Todd Stanmore and Vicky Coll, did well in their teams (Kingfisher and Wesnum3, respectively) at Junior British League matches. 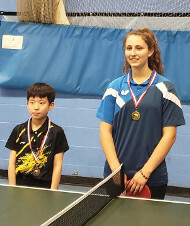 Two Oxford cadets, Ethan Zhang and Jasmine Stanmore, took away medals in the Improvers section of the Banbury Graded tournament. This was particularly impressive for Jasmine - a winner in her first ever competition! Lilli Foreman won both her singles matches against Hillingdon B.
Kiarash Shaddel, Jamie McNeil and Robbie Greenfield formed the A team, finishing up in 2nd place in the Division 1 table. Ethan Morgan, Jack Smith and Cooper Whitford formed the B team, getting relegated from Division 1 to Division 2. Scott Campbell, Ben Hague, Adam Jenner formed the C team, finishing up at 2nd place in Division 3. The D team consisted of Lilli Foreman and Tom Williams; they will be relegated from Division 3 and may find it more comfy in Division 4 next time. Two teams of Kidlington juniors took part in the next round of the National Cadet League (South), at Cippenham, with mixed results but some fine matches.